Watch the video above to see how simple the handling of the OneCup kits is. It shows the procedure for setting-up a Real-Time PCR in an 8-stripe Format. The hands-on time is less than 4 minutes. Order products directly by clicking here! 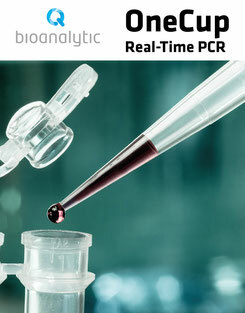 Test Our new OneCup Real-Time PCR Salmonella Kit! The OneCup assay comes along with a minimum of pipetting steps. Everything is included in the mix. You only need to combine 20µl of the mix with 2µl of your DNA sample and everything is ready. You have a minimum of hands-on time and you avoid mistakes during pipetting. 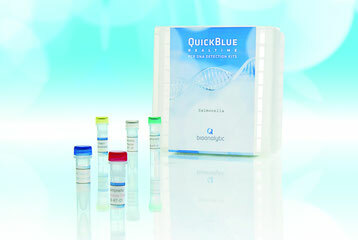 You can run the test on all common block cycler..
With Real-Time PCR Kits from Q-Bioanalytic you will have a large variety of products for testing for micro-organisms. Quickness, reliability and high sensitivity are the main features of the kits offered. We provide the set-up of Real-Time PCR technology in your laboratory and consult you with regard to your lab equipment when needed. We can also train your employees and help you establish these methods in your laboratory. Starting from the standard operation procedures (SOP) to handling pipettes so you can obtain those microliters correctly.